U.S. President Donald Trump rejoiced. Muslims shuddered. Senate Majority Leader Mitch McConnell’s campaign simply tweeted a photo, no words necessary. The shot showed McConnell with Neil Gorsuch, the conservative U.S. Supreme Court justice. McConnell got Gorsuch his seat on the court. And Gorsuch had delivered for Republicans, again. The Supreme Court ruled on Tuesday to uphold Trump’s ban on U.S. entry for people from seven countries, five of them with predominantly Muslim populations. The decision in Trump v. Hawaii was one of the most significant victories of Trump’s term, validation of a policy Trump critics around the world had taken to the streets to decry as bigotry. The vote was 5-4. Gorsuch was one of the five. The ban has been revised since the haphazard version Trump announced in his first week as president. The current version imposes restrictions on entry by people from Iran, Libya, Somalia, Syria, Venezuela, Yemen and North Korea. The decision was viewed by Muslim-Americans as an insult and an abomination. 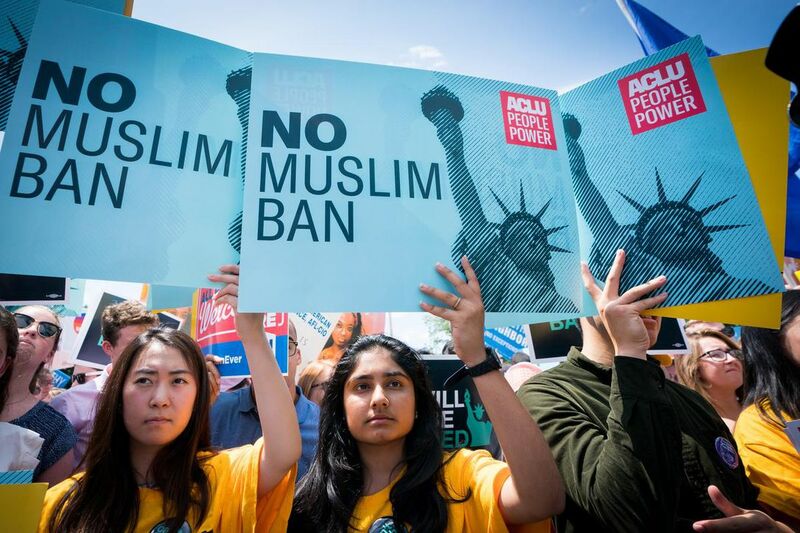 Muslim groups and civil libertarians likened the ruling to the 1944 ruling that upheld Japanese-Americans internment — a ruling the court belatedly repudiated in Roberts’s travel ban decision. Democrats, though, might be stuck on this Supreme Court road for a while. The travel ban ruling was only the latest big 5-4 victory for Republicans in the Gorsuch era. There are more to come. Also Tuesday, the court ruled 5-4 against a California law requiring anti-abortion “crisis pregnancy centres” to notify patients about the availability of state-funded abortions. Last week, the court ruled 5-4 to uphold a Texas political map a lower court said was designed by Republicans to discriminate against Black and Hispanic voters. Liberals will probably feel additional pain on Wednesday, when the court is expected to deal a dire blow to public-sector unions — quite possibly in a 5-4 decision. All of this is occurring because McConnell executed an unprecedented blockade of the liberal judge, Merrick Garland, Barack Obama nominated after conservative Antonin Scalia’s death in 2016. Democrats were confident Hillary Clinton would win the election and fill the vacancy, creating the court’s first liberal majority since the 1970s. Instead, they got an aggressive right-winger who generally votes like Scalia. “If I were President Obama, I would feel like I lost my chance to establish my legacy. I would lose sleep at night. Because so much of what he did is being undone, and largely by the Supreme Court,” said Lisa Tucker, a law professor at Drexel University and an expert on the court. Gorsuch, 50, could sit for 30 years or more. And Republicans can further solidify their position if Anthony Kennedy, 81, or Clarence Thomas, 70, decides to retire. A Thomas retirement might not make a dramatic short-term difference, since he is a reliable conservative vote. But Kennedy is the court’s swing voter, who sometimes sides with liberals. Replacing him with a Gorsuch-style conservative would give Trump an iron grip on the judiciary — and, regardless of how the rest of his presidency goes, a long-term policy legacy.